Sometimes, stress can be a good thing, but when healthy, everyday pressure turns into can't-slow-down anxiety, it's time to reevaluate. If you're struggling to keep up with your action-packed schedule and can't seem to calm down, don't worry. With a few quick changes, you can shift your priorities and learn to relax. 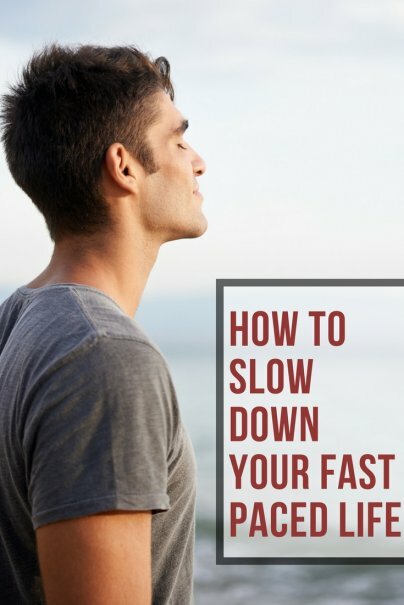 Try these six slowdown strategies for a simple, smoother way of life. For a few days, step back and see what overwhelms you most. Is it a time issue? Your work? Relationships? Find out what triggers your hectic lifestyle so that you can pinpoint some slow-down solutions. Turn off the push notifications for your cell phone's email, social media, news, and game applications. Check your apps only when you have the time. Otherwise, that constant flood of data will distract from the things you really need to get done, and unfinished tasks will only leave you more stressed. Out of sight, out of mind — at least, as much as it can be. Keep your phone and tablet in a drawer or in your purse so that you're not tempted to browse, especially as it gets closer to bedtime. Without your smart phone in sight, your thoughts will be more focused and you'll be more mindful in the moment. Truth is, you can't keep up with that go, go, go routine if you don't allow yourself to wind down every once in a while. For every few must-attend events, pencil in a date with yourself: a massage, a workout, or even just a couple hours to sit back and read. Is all that overtime necessary? Evaluate your productivity to be sure you're making the most of your 9-to-5 hours, then look for any opportunities to scale back. Also, don't be afraid to delegate tasks; asking for help shows that you're willing to collaborate. 6. Embrace the Ability to Say "No"
You don't need to be everybody's go-to helper, so let yourself say "no" sometimes. Being a "yes" person can be great, but if it's leaving you overwhelmed or resentful, it's time to be a bit more selfish with your time. Do you have any tips for reducing stress? Share them in the comments below! Another good tip is to take time to exercise. You can stay/get healthy, reduce stress, and give you mind some time to sort things out that are bothering you.